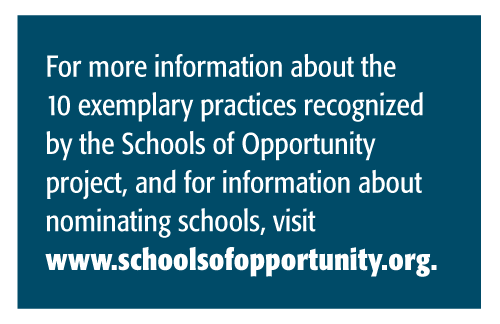 The Schools of Opportunity project recognizes public high schools that exemplify how research-based practices can challenge and support all students. Policy makers, journalists, and many parents tend to equate high-quality schools with high scores on standardized tests. Based on these test scores, common wisdom holds that the nation is rife with failing schools and that some of those schools are so bad that they should be closed or subjected to immediate takeovers. But standardized tests focus on just a narrow slice of student learning and experience; they provide neither insight into a given school’s strengths and weaknesses nor much evidence regarding whether the school should be closed or overhauled. To the contrary, differences in test scores and even in test-score growth often reflect differences in learning opportunities outside of school. Genuinely high-quality schools use research-based practices to improve learning and close opportunity gaps. Since 2015, the National Education Policy Center Schools of Opportunity project has identified and celebrated public high schools that have resisted the test-focused craze of the No Child Left Behind era and — rather than buckling under the pressure to focus solely on student outcomes — have made it a priority also to create strong and equitable opportunities for all students to learn. Some of these Schools of Opportunity are urban, some are suburban, and some are rural. Some are small, and some are large. Some enroll relatively advantaged students, while others enroll students from communities of concentrated poverty. What they have in common is their dedication to ensuring that students are not just held to high academic standards but are supported in meeting those standards. At these schools, students and educators have meaningful access to up-front and ongoing supports, services, and resources to help them succeed in school and in life. Drawing upon research described in the book Closing the Opportunity Gap (Carter & Welner, 2013), the Schools of Opportunity Project offers recognition based on a set of 10 exemplary practices (see p. 13). Over the project’s first two years, we have recognized 37 schools that excel in these ways, and in the process, we have learned that there is no single best approach to closing opportunity gaps; each school must meet the needs of its specific students. Accordingly, while some schools stand out for their work with students who have special needs, other schools shine for their community-based wraparound services or for their extension of rich, engaging learning time beyond the normal school day. Together, the schools illustrate how different combinations of research-based practices can create outstanding high schools. Still, though, while we have seen that schools can excel in many different ways, we have also found that no school can create a truly welcoming and engaging learning environment for all students without having at least two core practices in place: broadening and enriching learning opportunities (in particular, enrolling all students in challenging courses) and creating and maintaining a healthy school culture (including the use of discipline approaches that resist the trend of pushing students out of school). All young people should have opportunities to study a rich and diverse array of subjects (e.g., English, social studies, math, science, art, and music) and to study those subjects at advanced levels (e.g., by enrolling in Advanced Placement or International Baccalaureate classes, or by taking courses such as calculus and physics) (Clemmitt, 2006; Kyburg, Hertberg-Davis, & Callahan, 2007; Sadler et al., 2010). Every year, however, millions of high school students — disproportionately from low-income and minority backgrounds — are denied access to such opportunities, whether it is because their schools lack the resources to offer such courses, because their teachers haven’t recommended them for advanced coursework, because their test scores fall below a certain benchmark, or for some other reason (Mathews, 1998; Oakes et al., 2000; Schmidt et al., 2015; Solorzano & Ornealas, 2004; Tyson, 2013). In contrast, Schools of Opportunity remove these barriers by providing engaging electives and college-preparatory courses for all students (Burris & Welner, 2005). In 2010, Rainier Beach High School in Seattle was on the verge of closure due, in part, to severely declining enrollment. Built to hold 1,200 students, enrollment had shrunk to just 320. After much debate about how best to reinvent the school, community members and school leaders agreed to introduce an International Baccalaureate (IB) curriculum. (The IB program is an international educational program known for its pedagogical training, challenging coursework, and rigorous assessments.) Today, nearly every student at Rainier Beach takes at least one IB course, and most students take three or more of them (including some students who previously would have been placed in sheltered special education courses). In addition to changing the curriculum, overhauling the school schedule, and investing in teacher development to provide an effective IB program, Rainier Beach also trained its special education teachers in IB methods to support a new coteaching model. Further, the school created extra supports for students, including in-class tutors and an after-school homework center, and it arranged for faculty to meet weekly in grade-level teams to identify students who might need additional help. All young people should have opportunities to study a rich and diverse array of subjects and to study those subjects at advanced levels. Since the introduction of the more rigorous curriculum, Rainier Beach’s enrollment has more than doubled. Its students (75% of whom receive free or reduced-priced lunch; 40% come from immigrant or refugee backgrounds) still score much lower on achievement tests than do students from more advantaged communities, but their performance has improved significantly, and they now enjoy far stronger opportunities to learn. A decade earlier, on the other side of the country, the leaders of South Side High School in Rockville Centre, N.Y., implemented a similar reform, providing all students with access to the IB curriculum. Today, every 11th grader (including those receiving special education services) takes IB courses in English and history, and more than half of the students complete the full set of extremely challenging requirements to receive the IB Diploma. For all students, the school offers a core set of supports, including an early morning “zero period” (a before-school session in which teachers are available to help students), reading and writing labs, and support classes. Since South Side opened its IB courses to all students, other measures of success have followed. For example, 100% of South Side graduates have earned New York State Regents Diplomas, with more than 80% of graduates earning advanced designations. Moreover, South Side does not lose students along the way; its 9th graders become its graduates. South Side illustrates how all students can succeed in a rich and rigorous curriculum. The school serves a substantially more advantaged student population than does Rainier Beach, and its outstanding outcomes reflect those advantages. But the school formerly had a large test-score gap between these more advantaged students and the school’s low-income students of color — a gap that closed dramatically after the school detracked its curriculum. Schools of Opportunity also work to create a school climate that supports the academic, social, and emotional development of all students. Every young person ought to have the opportunity to study in a place that feels safe and supportive and where conflicts are handled in productive ways. But many high schools create harsh and distrustful environments, where students are kept in line by constant threats of punishment and where students are frequently pushed out. By contrast, several of the recognized Schools of Opportunity have embraced restorative justice, which seeks to minimize the use of exclusionary disciplinary practices such as suspensions and expulsions. Instead, teachers and administrators aim to create a school culture in which conflicts are resolved quickly and maturely and where greater priority is given to healing damaged relationships than to punishing individuals who’ve done something wrong. While it is sometimes necessary to suspend or expel students, educators who practice restorative justice recognize that those forms of discipline come at a very high cost and should be avoided if possible. Students who are excluded from class miss valuable instructional time and adopt negative academic identities, leading to higher rates of truancy and dropping out (Scott & Barrett, 2004; Newcomb et al., 2002; Jimerson et al., 2000; Townsend, 2000). Further, these punishments tend to be applied disproportionately to students of color, low-income students, and students with disabilities. For example, black students are three to four times as likely to be suspended or expelled as their white counterparts for identical infractions (Losen et al., 2015). The alternative is to build a culture of mutual respect among students and between students and faculty. For example, at Hillside High School — a large, comprehensive high school in San Mateo, Calif. — students are grouped into small learning communities (SLCs) where they meet with teacher advisers daily to participate in activities focusing on community building, tolerance, equity, and social-emotional learning. SLCs are also the place to talk through and resolve minor conflicts and infractions. Advisory teams, in turn, meet regularly with school administrators to identify emerging patterns of misbehavior among students and, if possible, to come up with ways to address them. If disciplinary problems persist or become more serious, then the dean, the school psychologist, and the School Safety Advocate become involved as well. These practices have enabled Hillside to reduce its suspension rate dramatically, from 11.7% of the student population in 2009-10 to just 4.75% five years later, while the expulsion rate decreased from .47% to .07%. Further, in the increasingly rare circumstance when a suspension does occur, the student is required to go through a carefully designed reentry process that includes incident review conferencing, signing a behavioral contract, working to resolve lingering conflicts, making amends for harming teachers and peers, and otherwise reintegrating into the community. For example, Leland and Gray Middle and High School in Townshend, Vt., has implemented both an exemplary restorative justice program and provides all students with opportunities for varied and advanced coursework. Though Leland and Gray is a rural school in an economically struggling region — roughly half of its students come from low-income backgrounds — it offers a wide range of AP and dual-credit courses, which all students are eligible (and strongly encouraged) to take. Further, the school provides extra support classes in English and mathematics, tutoring before and after school each day, and professional development to help teachers provide differentiated instruction in advanced courses. Although not every student chooses to take AP or dual-credit courses, all students take a college-preparatory course of study, which is provided as the default curriculum. No single best practice will close opportunity gaps. Different combinations of research-based practices can meet the needs of a school’s specific students. Additionally, Leland and Gray requires all faculty, staff, and students to participate in an annual restorative justice training seminar, focusing on self-regulation. The school has also granted students a set of rights (codified in the student handbook), such as the right to complain, protest, and distribute literature, in return for their commitment to resolving personal conflicts peacefully and conclusively. Rates of suspension and expulsion have declined dramatically, and while such forms of punishment are still reserved for the most egregious offenses, the school makes every effort to provide in-school suspensions so students can continue to receive educational and support services. Crater Renaissance Academy (CRA) in Central Point, Ore., also illustrates how a school can address opportunity gaps in both course access and school culture. Created in 2007, CRA is one of four autonomous small schools emerging from a former comprehensive high school that served 1,400 students. Today, CRA enrolls 463 students, including 64% from low-income households. The old system at the previous comprehensive high school funneled many underperforming students into GED programs, vocational classes, and remedial tracks. Only the most elite students were allowed access to more advanced courses. However, CRA’s leaders rejected this system of sorting and stratification, and the school requires no GPA or test-score cutoffs for students to be eligible to take challenging courses (including AP classes offered on campus and others offered online). CRA also eliminated the old lower-track classes, ensuring that all students have access to a college-preparatory curriculum. Further, the school is careful to design its master schedule with access in mind so that scheduling conflicts don’t prevent students from taking rich and rigorous courses. CRA’s commitment to access is further reflected in its discipline policy, which emphasizes restorative justice. For example, after viewing and discussing “Bully,” a documentary about two teenagers who committed suicide after being bullied, a group of students took the initiative to craft behavioral guidelines for peers and teachers, including descriptions of bullying and effective ways to address it. A copy of the guidelines is now included in students’ daily planners. CRA also eliminated the practice of suspending students for missing school, opting instead to reach out to students and families to ask them to sign attendance contracts. And in the rare instance where chronic tardiness does result in a suspension, the student is required to spend the time on campus and complete any missing assignments. Perhaps the greatest indicator of CRA’s commitment to restorative justice is that the school no longer sends chronically misbehaving students to an alternative program, which the old comprehensive high school did routinely. Today, the school takes responsibility for helping every child become a responsible member of the community. The five Schools of Opportunity profiled here refuse to ration access to their most advanced and interesting courses, they refuse to push out or exclude students who struggle with behavioral issues, and they refuse to define test scores as their sole measure of success. By documenting and recognizing schools that invest in a range of ways to support each and every student, the Schools of Opportunity project provides concrete evidence that schools can pursue and achieve the promise of public education in a democracy. This project does not celebrate a few “miracle” schools that get disadvantaged students to post impressive test-score gains. Nor are we trying to prove that superhuman educators can overcome the effects of poverty. Rather, we simply believe that schools can and should do much more to bridge the divides that separate our more and least advantaged communities. For these reasons, we think that it is important to identify schools that are accomplishing exactly what a good school should be expected to accomplish: to close the gaps that they can. The recognized Schools of Opportunity demonstrate that school quality can be measured by far more than just test scores. In doing so, they offer exemplars and a path forward for the nation’s schools. Burris, C.C. & Welner, K.G. (2005). Closing the achievement gap by detracking. Phi Delta Kappan, 86 (8), 594-598. Carter, P.L. & Welner, K.G. (2013). Closing the opportunity gap: What America must do to give every child an even chance. New York, NY: Oxford University Press. Clemmitt, M. (2006). AP and IB programs: Can they raise high school achievement? The Congressional Quarterly Researcher, 16 (9), 193-216. Jimerson, S., Egeland, B., Sroufe, L.A., & Carlson, B. (2000). A prospective longitudinal study of high school dropouts: Examining multiple predictors across development. Journal of School Psychology, 38, 525-549. Kyburg, R.M., Hertberg-Davis, H., & Callahan, C.M. (2007). Advanced Placement and International Baccalaureate programs: Optimal learning environments for talented minorities? Journal of Advanced Academics, 18, 172-215. Losen, D.J., Hodson, C.L., Keith, I.I., Michael, A., Morrison, K., & Belway, S. (2015). Are we closing the school discipline gap? K-12 racial disparities in school discipline. Los Angeles, CA: Center for Civil Rights Remedies. Mathews, J. (1998). Class struggle: What’s wrong (and right) in America’s best public high schools. New York, NY: Random House. Newcomb, M.D., Abbott, R.D., Catalano, R.F., Hawkins, J.D., Battin-Pearson, S., & Hill, K. (2002). Mediational and deviance theories of late high school failure: Process roles of structural strains, academic competence, and general versus specific problem behavior. Journal of Counseling Psychology, 49, 172-186. Oakes, J., Rogers, J., McDonough, P., Solórzano, D., Mehan, H., & Noguera, P. (2000). Remedying unequal opportunities for successful participation in Advanced Placement courses in California high schools: A proposed action plan. An expert report submitted on behalf of the plaintiffs in the case of Daniel v. the State of California. Unpublished report. Sadler, P.M., Sonnert, G., Tai, R.H., & Klopfenstein, K. (2010). AP: A critical examination of the Advanced Placement program. Cambridge, MA: Harvard Education Press. Schmidt, W.H., Burroughs, N.A., Zoido, P., & Houang, R.T. (2015). The role of schooling in perpetuating educational inequality: An international perspective. Educational Researcher, 44 (7), 371-386. Scott, T.M. & Barrett, S.B. (2004). Using staff and student time engaged in disciplinary procedures to evaluate the impact of schoolwide PBS. Journal of Positive Behavior Interventions, 6, 21-27. Solorzano, D.G. & Ornealas, A. (2004). A critical race analysis of Latina/o and African-American Advanced Placement enrollment in public high schools. The High School Journal, 87 (3), 15-26. Townsend, B.L. (2000). The disproportionate discipline of African-American learners: Suspensions and expulsions. Exceptional Children, 66, 381-391. Tyson, K. (2013). Tracking, segregation, and the opportunity gap. In P. Carter & K. Welner (Eds. ), Closing the opportunity gap: What America must do to give every child an even chance. Oxford, United Kingdom: Oxford University Press. Originally published in September 2017 Phi Delta Kappan 99 (1), 8-14. Does the curriculum include a range of subjects, activities, and experiences that provide a full, high-quality education? Is it designed with the particular needs of the students in mind? Do students at this school have access to broad and meaningful learning experiences? Has the school taken steps toward universal access to accelerated and supported learning opportunities? Do all students have access to honors, IB, and AP courses? Has the school abolished low-track classes with low expectations? To what extent do all groups of students participate in college counseling programs and in PSATs, SATs, and ACTs? Has the school taken steps to create a safe, welcoming school environment for all students, including students from all racial, ethnic and religious groups, genders, and sexual orientations? To what extent has the school developed clear plans to proactively include the culture and identity of all students on campus and in the curriculum? How does the school prevent discrimination for different sub-populations, and how does it equitably and effectively resolve bullying or discrimination when it occurs? What national or local resources and curriculum does the school use to support the academic, social, and emotional well-being of students? How does the school include parents as partners in the development of school culture? What does this school do to ensure that student discipline is approached equitably? Is it as nonexclusionary as possible? Does the school have an active and successful plan to help students learn positive behavior and maintain self-control? Does the school provide learning resources for suspended students so that they do not fall behind? Do suspended students and their families understand their rights and obligations, and do they have knowledge of and access to a clear appeal process. Has the school engaged in initiatives to extend or enrich learning time? How does the school ensure that all students access these opportunities? Does the expanded time focus on broadening and deepening students’ knowledge and understanding of curricular topics and engagement in learning? Does the school partner with external organizations in implementing the plan? Does the school design and use assessments of students’ work, knowledge, and skills to help teachers understand how well their students are learning and to provide feedback that improves curriculum and teaching? Are assessments student centered, and do they provide prompt and useful feedback? Do teachers have the time and resources to use multiple forms of assessment to analyze student learning? Has the school resisted the current push to place standards-based accountability testing toward the center of teaching and learning and evaluation of its teachers? Does the school employ a variety of collegial and sustained professional development activities (e.g., mentoring relationships between new teachers and experienced teachers, high-quality teacher induction programs, professional development drawing on school-level expertise, professional learning communities, collaboration among teachers, and relationships between teacher teams and social service support providers that serve students and families)? Does professional learning promote instruction that is culturally relevant and develop a cadre of well-trained teachers who have a deep understanding of students’ strengths, needs, and diversity? Does the school support efforts to develop healthy and beneficial attitudes and beliefs among administrators, teachers, and school personnel (and students) regarding teaching, learning, and student capabilities? Does the school provide fully resourced programs designed to support students with special needs in the least restrictive learning environment? Is inclusion the norm, and does the school avoid inclusion classes that are low-track classes filled with high-needs learners? Does the school provide supports for all modifications and provide layers of support for students with special needs (from moderate to severe)? Are special education students actively engaged in the social life of the school? Does the school fully comply the word and spirit of the Child Find mandate, while taking care to avoid inappropriate over-identification of low-income students, students of color, and English language learners? Does the school create partnerships to provide for unaddressed health issues such as physical and mental health, eye care, and dental care, as well as nutrition needs of the students and/or their families? Are families in need of housing, clothing, or legal advice connected to service providers? Does the school understand and respond to additional basic needs? Does the school provide these services on campus? Are off-site physical and mental health, dental, vision, and nutrition providers easily accessible to students and families? Are there efforts to coordinate between academic and non-academic supports? Do families have adequate transportation to access the services? Does the school offer culturally relevant (or “responsive”) pedagogy, as evidenced through literature, projects, assignments, events and field trips, ethnic studies courses, connections to families and communities, interventions, and other resources? Are these curricular experiences accompanied by supports for students and their teachers to ensure that learners are challenged and successful at a high academic level? Does the school start from this asset-based approach? Does the school employ effective strategies such as providing all teachers with professional development about the unique needs and strengths of language minority students, ensuring that language minority students have access to qualified bilingual teachers, and including language minority students in all aspects of the academic and social life of the school? Does the school support language minority students’ academic learning in all subject areas as they move toward fluency? Does the school communicate with language minority students and their families to ensure that student needs beyond language are met? Does this school have formal and informal policies and structures to engage parents and communities in school decisions about programs, curriculum, or budgets? Do teachers and school staff receive professional development about how to work with diverse families and communities? Do parents feel welcome on campus to support their children and to help guide the school? Are parent and community meetings held at multiple times so working parents can attend? Are childcare and live translation provided during meetings, parent conferences, and school events? Is there a translator on campus to support daily parent communication? Is there trust between the school and the larger community? Are there formalized partnerships with community organizations to bring additional resources and programs into the school? Source: The Schools of Opportunity project (http://schoolsofopportunity.org), drawing on research in Carter, P.L. & Welner, K.G. (2013). Closing the opportunity gap: What America must do to give every child an even chance. New York, NY: Oxford University Press. SARAH E. LACOUR (sarah.lacour@colorado.edu) is a doctoral candidate, University of Colorado Boulder. ADAM YORK is a research associate, National Education Policy Center, University of Colorado Boulder. KEVIN WELNER is a professor of education policy and director of the National Education Policy Center, University of Colorado Boulder. MICHELLE RENÉE VALLADARES is associate director, National Education Policy Center, University of Colorado Boulder. LINDA MOLNER KELLEY is codirector, Schools of Opportunity, University of Colorado Boulder. The posted teaser headline is “Closing the Achievement Gap.” That is misleading in a manner that should be considered journalistically and pedagogically unethical. The article does seem to embody sensible rules for operating an effective, just, fair and equitable school. The article does not offer any guidance about how to close the academic achievement gaps that have successfully resisted all of the school “reforms” that our politicians have dreamed up and most of our K-12 practitioners and their collegiate training programs have foolishly and silently obeyed. School “reform” has been tried in America since at least 1965 and it has never worked. K-12 schools are not pedagogical hospitals that somehow “heal” defective students. They are merely schools and they cannot produce better students than they enroll. Except for very occasional and mostly unsubstantiated anecdotes fueled by magical thinking, schools have never succeeded at changing the fundamental nature of any student. The quality of any finished product is limited by the quality of the raw material no matter how skilled the artisan. America should stop asking schools to repair the damage inflicted on innocent children during the 91 percent of each childhood spent beyond the humane reach of K-12 teachers. Rob Bligh is correct! PDK should ask Rob to write an article about school improvement and all of the time and money wasted by educators on fads, grants, buildings designs, etc..